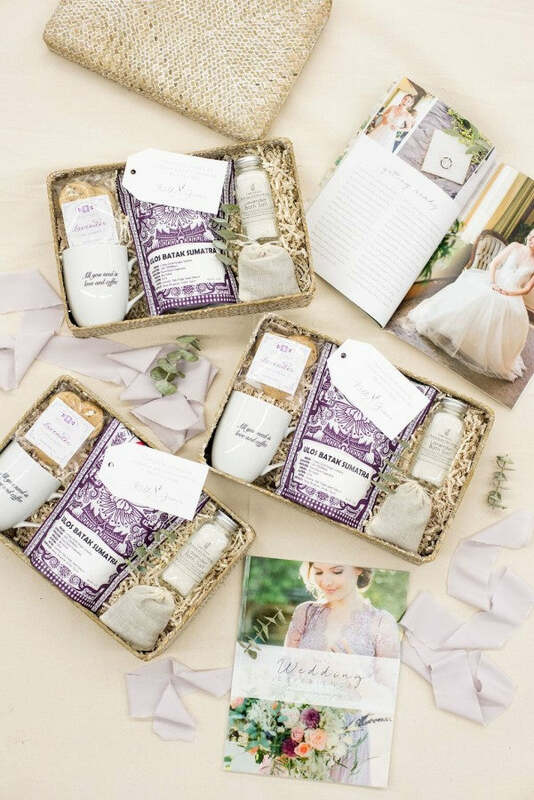 When Kelly of Kelly Grace Photography came to us for help designing custom client gifts, she expressed her desire to make her couples feel special since, after all, weddings are special. We were super excited to curate gifts that express her soft, romantic, authentic brand! 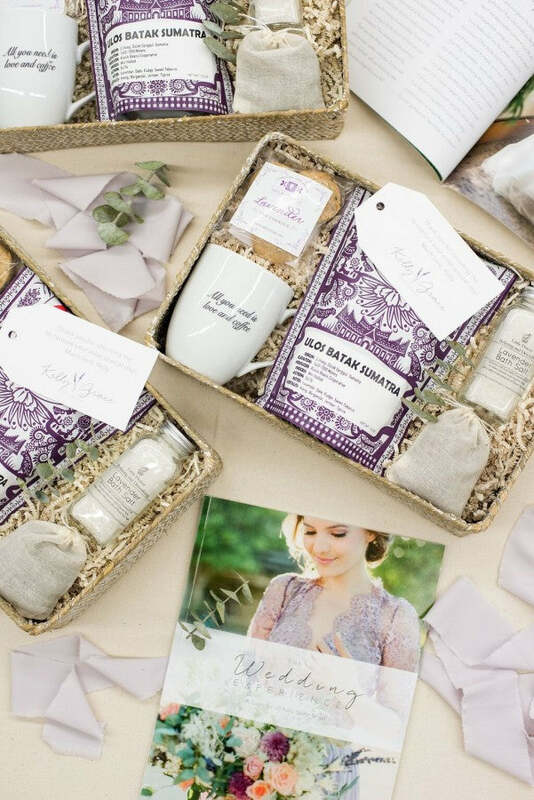 Since Kelly's clients tend to opt for outdoor weddings in natural settings, we intentionally selected packaging that was somewhat earthy with plenty of texture. Woven baskets were a great fit! 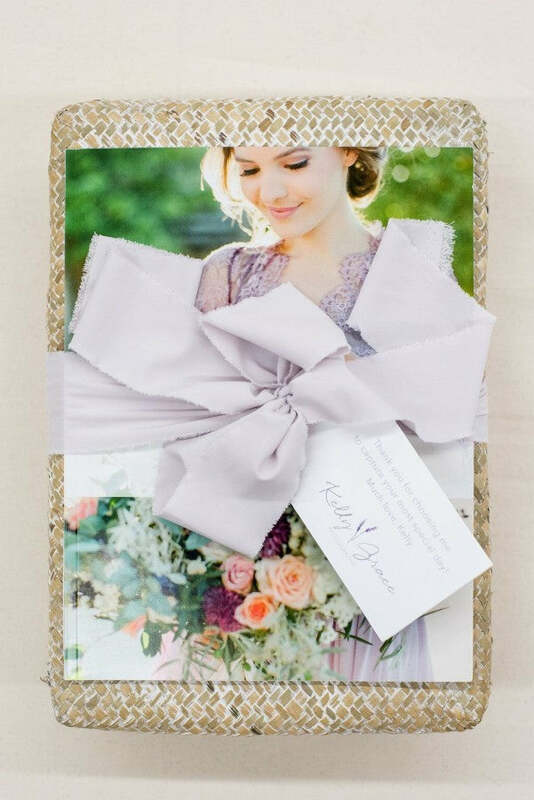 In keeping with her brand, we kept the color palette soft with plenty of lavender. We chose small batch coffee, lavender bath salts, lavender sachets, and even lavender tea cookies! 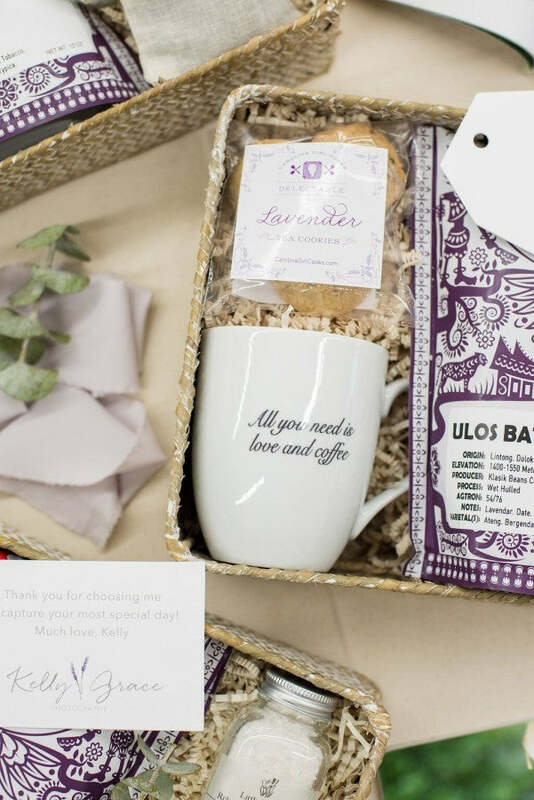 For something special that her clients can use long after the wedding is over, we created custom mugs featuring an expression that resonates with Kelly: "all you need is love and coffee." Also great to accompany the coffee that we selected for her gifts. For printed materials, we custom designed gift tags with a short and sweet welcome message along with her gorgeous logo, tied on with lovely raw edge ribbon. In lieu of a traditional welcome note inside the gift, we instead included Kelly's wedding guides she created to help prepare her clients for their engagement session as well as the wedding day. The guides were absolutely gorgeous on the baskets and really tied everything together perfectly! What do you think of Kelly's client gifts? Do you feel they accurately represent her brand? Let us know in the comments! We'd love to hear from you. For more information on our Custom Gift Design Service, visit here! We'd love to learn more about your client gifting goals and see if we can help!